With market forces pushing rents ever higher in Portland and throughout the state, Michael Parkhurst is looking for creative strategies to lower the cost of providing homes to those who might otherwise live on the streets. “I think there’s a widespread sense that if we keep doing what we’ve been doing, we’re never going to meet more than a sliver of need,” said Parkhurst, program officer for the Meyer Memorial Trust, who helps lead the trust’s $15 million, five-year Affordable Housing Initiative. Last year, the Meyer trust gave Eugene’s Square One Villages $148,200 to support an unconventional housing alternative: a homeless village. Emerald Village, which broke ground in May, is a permanent, cooperatively owned settlement. Each of its 22 tiny houses, ranging from 160 to 280 square feet of living space, will have its own kitchenette and bathroom and will rent for $250 to $350 per month. Construction on the village began in May. “If you’d have asked me a few years ago, would Meyer Memorial Trust be putting money into that, I’d have been skeptical,” Parkhurst says. Originated by homeless individuals as an act of social protest, a homeless village can be defined simply as a group of homeless people living together as a self-governed community with basic hygiene facilities and trash service. Though most villages are more primitive than Emerald Village — lacking plumbing, for instance — they are cost-effective and humane compared to mass shelters, advocates say, and provide a social infrastructure that helps houseless people heal from trauma. The model is gaining converts. The city of Portland and Multnomah County, for the first time, became founding partners in a homeless village this year, offering a year of free rent on a vacant city-owned parcel in North Portland’s Kenton neighborhood, plus $350,000 in capital, start-up and operating costs for Kenton Women’s Village. It joins three other Portland villages formed by homeless individuals since 2000: Dignity Village, Right 2 Dream Too and Hazelnut Grove. Yet to many in the profession of providing affordable housing and homeless services, including some local institutional leaders who support them, homeless villages remain controversial. All four of Portland’s villages receive at least a modicum of public support, mostly garbage and portable-toilet service, and Kenton’s public subsidy is far higher than the others. But none of Portland’s four homeless villages have running water, wired electricity or — other than a few exceptions for people with disabilities — heat. At Dignity Village, Portland’s oldest village at 17 years, public health hazards are a fact of life. The community, located on city-owned industrial land not far from Portland International Airport, is amazingly clean and orderly, especially considering its 53 residents have built and must repair all 43 units, and must battle periodic coatings of black dust from the adjacent city leaf-compost facility. Still, there are piles of junk all about, and pests are a problem. Its spokesman Rick Proudfoot never leaves his door open. Homeless villages are, moreover, almost universally seen as unsuitable for children. None of Portland’s four homeless villages allow kids. Andrea Cantu-Schomus, spokeswoman for the Oregon Department of Human Services Child Safety Division, confirms the state has never placed a child in state custody into a village or tiny house. Margi Dechenne, housing transition program manager for Catholic Charities of Oregon, which is providing case management for Kenton Women’s Village’s 14 residents, says that’s as it should be. “Children need a more stable environment,” she says. Drug and alcohol use is another issue. One in five people experiencing homelessness has a chronic substance-use disorder, according to the 2016 annual Homelessness Assessment Report. To create a supportive environment for those seeking sobriety, Dignity Village, Kenton Women’s Village and Right 2 Dream Too prohibit the use of drugs and alcohol on-site. Hazelnut Grove board member Bob Brimmer says the law of the land at the village is akin to a “sippy cup rule” — no open cups and no outrageous behavior. A “sippy cup rule,” however, could be too lenient for some people seeking sobriety or safety from those who are actively using drugs or alcohol. Parkhurst says a key concern for many is that some residents might “get stuck” in homeless villages, and not transition into permanent housing. It’s a drum The Oregonian editorial page has been beating since Dignity Village’s founding in 2000. “By helping Dignity become more entrenched, the city — and the many good-hearted Portlanders who volunteer at the camp — have mostly helped the homeless stay homeless,” the newspaper warned in one editorial. “There’s nothing ‘transitional’ about Dignity Village,” said another. In a May visit, a reporter talked to three of the village’s 53 residents; all said they’d lived there between seven and 10 years. That includes spokesman Proudfoot, who said he’s put his name on dozens of affordable housing wait lists but never gotten higher than No. 226. Katie Mays, who works for Portland social services nonprofit JOIN, sighs audibly when asked how many Dignity Village residents she’s helped find permanent housing since she started doing outreach work with the homeless village in 2014. The number, she acknowledges, is “lower than we would like” — about a dozen. Village advocates offer unverified informal estimates of how many residents have transitioned to permanent housing from other villages. Dignity Village and Right 2 Dream Too co-founder Ibrahim Mubarak says “over 400 people” who stayed at Right 2 Dream Too found permanent housing before he left the organization on Feb. 1. Vahid Brown, housing policy coordinator for Clackamas County and a Village Coalition steering committee member, estimates “a dozen” Hazelnut Grove residents have found permanent housing since it was founded in 2015. Some residents, such as Brimmer, appear reticent to go back to regular apartments, though it’s not always clear why. Brimmer, who says helping construct Hazelnut Grove has turned his life around, hesitated when asked if he’d take a subsidized apartment if one came along. 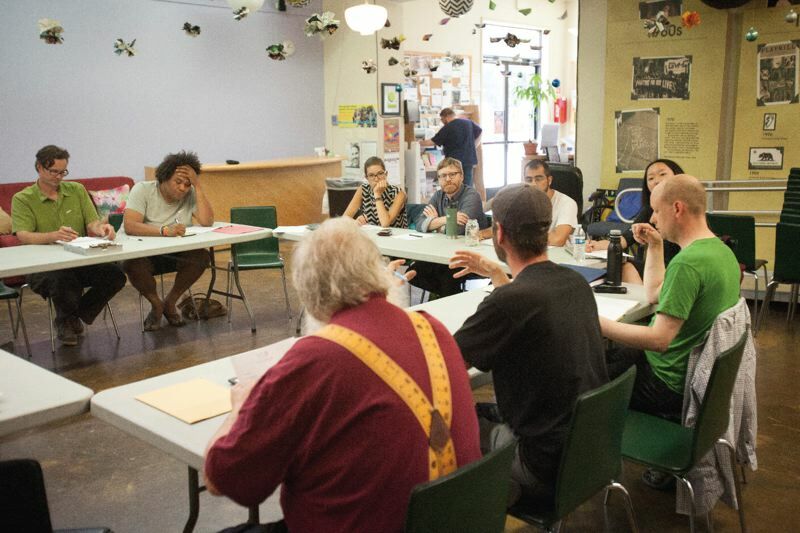 PHOTO BY JAIME VALDEZ – The Village Coalition, shown here in a recent meeting, works on ways to spread and improve the movement. David Bikman chairs the steering committee of the Village Coalition, a grassroots organization founded last year, which advocates for residents of Portland villages. Asked whether villages can adequately control substance abuse and provide safe homes for children, Bikman emphasizes that the coalition, which has no paid staff, does not speak for individual villages or prescribe what form they should take. “We want whatever our houseless people tell us they want,” says Bikman, an administrator at Portland State University’s Graduate School of Education. The coalition doesn’t support illegal or unsafe activity at the villages, Bikman says, though it does support villages having containers to dispose of needles used to inject drugs, such as heroin. If a village wanted to house kids, that would be “fine,” he says, but it would need “extensive” support that Portland’s four villages currently don’t have. Some national experts on homelessness, citing reasons similar to Bikman’s, say the village concept merits exploration. While the 12 percent decline in unsheltered homeless people between 2015 and 2017 reflects efforts by the city and county to open more than 600 shelter beds, the supply of shelter beds and affordable housing does not meet the need. The 2017 Point-in-Time count of homelessness showed the county’s overall homeless population grew 9.9 percent in two years. Demand for shelter alternatives has prompted local leaders to authorize public funding for Portland’s four homeless villages, and to partner in the formation of the newest, Kenton Women’s Village. Kenton Women’s Village is a hybrid model of sorts, which responds to some, if not all, criticisms voiced by skeptics. Though it lacks plumbed toilets, its 14 tiny “sleeping pods” are sturdy and architect-designed. Drug and alcohol use are not allowed on site, and five case managers and a full-time village manager employed by the nonprofit Catholic Charities of Oregon will work with residents to find permanent housing and resolve conflicts or problems as they arise. Yet in the big picture, homeless villages are still on the fringe: Portland’s four villages combined provide shelter for only about 160 people. And public leaders have not yet endorsed expanded investment in villages. Multnomah County Chair Deborah Kafoury spoke encouragingly at a June 9 media event for Kenton Women’s Village of those who “stepped up” to try a different approach. Yet Kafoury says temporary shelter options like the Kenton village are not going to solve the county’s fundamental shortage of affordable housing. “I still think that every dollar we invest in something other than permanently affordable housing is a dollar away from permanently affordable housing,” Kafoury says. For Jolin, the big hope for Kenton is that residents will use the village as a springboard to a rental contract. “I think we’re all hoping to draw on the benefits of the village model, and the power of the self-governance concept, and couple it with a commitment to providing the kinds of services that will quickly allow (residents) to transfer into permanent housing,” Jolin says. For his part, Parkhurst says he still has questions about the long-term durability and “all-in” costs of tiny homes, but believes the scope of the crisis demands creative solutions. This story is part of Giving Ground, an investigative series produced by the Open: Housing Journalism Collaborative, a joint project of Open: Housing, Pamplin Media Group and KGW. Look for other stories in this and related series at .>www.OpenHousing.net. Previous Previous post: Portland is Towing Caravans of RVs Off the Streets. Here’s What It’s Like Inside Those Motor Homes.